Natural beauty abounds in Southern Utah with towering red rock spires and deep-cut canyons. Most people who visit the region are looking to explore the great outdoors, whether they plan to hike, bike, or ski through the majestic mountains. If you’re planning a trip to the area, you should add hiking in Dixie National Forest to your list of must-do activities. 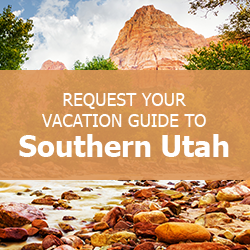 To help cut your travel planning time in half, request a copy of our complimentary Southern Utah Vacation Guide! You’ll have access to insider tips and local recommendations on the best things to do in the area. Learn more about hiking in Dixie National Forest, plus find out about other great trails nearby. Begin this hike at the Cascade Falls Trailhead located near Grand Lake. Then, follow the 0.8-mile route atop the Markagunt Plateau. This hike is perfect for families with children because it’s a quick, easy loop with beautiful scenery along the way. You’ll witness an unparalleled view of nearby Zion National Park and the Virgin River. The cascades themselves begin at Navajo Lake before flowing through an underground lava tube and eventually creating this gorgeous sight. The surrounding scenery on the Bristlecone Pine Trail is entirely different from that of the trails in Bryce Canyon National Park. Here, you won’t find the same dusty, red rock formations. Instead, the trail is lined with towering, green pines, spruces, and aspens. Marvel at these magnificent trees, some thousands of years old, as you make your way to the lookout point. From this observation deck, you can more closely examine the trees and catch glimpses of Zion National Park. Hiking in Dixie National Forest would not be complete with a trek through the Aspen Mirror Trail. Travelers staying in Duck Creek Village will love how close this path is to the town. Offering another unique landscape, the Aspen Mirror Trail passes by a beautiful mountain lake surrounded by aspens. This short, half-mile trail is relatively flat, making it another great option for people hiking with kids. With properties in four different Southern Utah towns, Family Time Vacation Rentals offers dozens of options for comfortable accommodations. Each location is conveniently located near popular attractions as well as state and national parks. To make the most of your trip, stay in one of our homes, which will allow easy access to hiking in Dixie National Park plus Bryce Canyon and Zion National Park. Large groups or multiple families planning a getaway together will love staying in The Adventurer rental. With room for up to 13 guests, this wood cabin is located in Duck Creek Village’s Elk Ridge Estates neighborhood. In the evenings, you can enjoy an alfresco dinner cooked on the propane grill. Then, enjoy some friendly competition on the ping pong table. Browse our complete catalog of available properties and start planning your Southern Utah getaway!